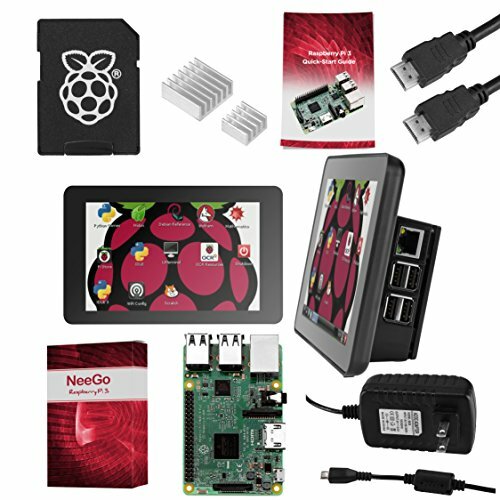 Aspiring techies everywhere can master computer science 101 at home or in the classroom with the Raspberry Pi 3 Ultimate Starter Kit. This all-in-one barebones bundle arrives with the latest high-speed, energy-efficient tools necessary for building your very own credit-card sized computer. The lightning-fast model B motherboard features a 64-bit quad core central processing unit, integrated Wi-Fi, Bluetooth Low Energy (BLE) and 1GB of RAM. For the first time ever, our complete set also includes an innovative 7" touchscreen display, eliminating the need for a monitor, mouse or keyboard. Just use the provided HDMI cable, 16GB micro SD card, heatsinks, noise-filtered power source and specially designed protective case to craft an enjoyable educational gadget. This is the micro computer that changed the world-and it's easier than ever! An amazing gift for pros (and dummies)! Let your imaginative brain dream big-and build bigger!